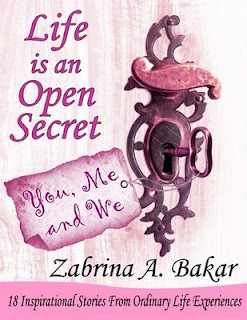 Last week, I revealed for the first time the content of my latest islamic motivational book Life is an Open Secret- You, Me and We on my blog, alhamdulillaah. And i promised that the coming week, i will give away one free story, from the book itself, specially for the readers of Life Storyteller Motivational Blog. The Story of a Man with His Bag of Gold! Anyway, the first part of the email asked me to answer three simple (I wish!) questions. Why don't you answer them with me, agree? 2. Name any ten people who have won the Nobel or Pulitzer Prize. 3. Name the last half dozen Academy Award winners for best actor and actress. Yikes! Goodness, I think I am experiencing not only a major blonde moment here, but probably brunette, black, red and brown too! 1. List a few people who aided your journey through school. Now, these I can answer! Alhamdulillah (praise be to Allah) My heart smiled as I reflected on their names, the names of the individuals who had touched my life in their own wonderful ways. This was when it suddenly hit me- BAM! These names are not only merely names. These names represented something more significant, something greater than the persons themselves. Yes, they do! Sniff, sniff… hmmm…Yup, they absolutely have the perfect right rose scent on their hands! Do you want to know the kind of roses they held and gave me? In many words - compassionate, sympathetic, thoughtful, concerned, caring, considerate and empathetic. In one word- kindness! Absolutely! Ah- yes! I agree with you, Lao Tzu. Have you met these kinds of people, my friends? The ones who always say the right thing, think the right way and make you feel everything is going to be right again? The ones whose act of kindness we never could forget? There are two types of people - those who come into a room and say, "Well, here I am!" and those who come in and say, "Ah, there you are." I chuckled when I read what he said the first time. Somehow that UB40 song "Here I Am Baby" started humming in my head! Okay, okay. Where was I? So, I absolutely love the name Mr. Frederick gave- Here-I-Am versus There-You-Are! During the times when we are freezing cold, they come with a blanket and say Here-I-Am. When we are hungry, they have food in their hands and say Here-I-Am. When we need support, they lend their shoulders and say Here-I-Am. When we are limping in pain, they hold our hands and say Here-I-Am. They say Here-I-Am and share the only biscuit they have with us. They pick up our phone calls at midnight and say don't worry, Here-I-Am. During moments when we feel all alone and lonely they come knocking on our doors and say Here-I-Am. And sometimes, when they see us teary from far, they come closer and say Here-I-Am darling, don't worry about a thing. They made me ask myself- Am I living a life as a Here-I-Am person or There-You-Are person? Which one are you, my brothers and sisters? Ya Allah… (O my God). Did Allah just use the word woe? Woe to the ones who refused to render small acts of kindness? Do we know the implications of this word woe, my friends? As I flipped the pages of my big red dictionary, I learned that the word woe meant serious (Code Red!) grief, misfortune, affliction, sadness, despair, misery and wretchedness. Gulp! Na`udhubillah (We seek refuge in Allah) I could feel my knees going wobbly suddenly. Let us ask ourselves- have we ever ignored an old man who has difficulties crossing the road? Or our mother's requests to massage her painful back and tired feet? Have we helped our baby brother to tie his shoe lace? Or comfort a friend whose confidence was shattered by words of others? Perhaps helped orphans who needed donations? Assist a lady with a flat tire on the road? Helped out a homeless who asked for a glass of water? Given aid to a stranger who looked lost? Fulfilled a request for a volunteer to help out in the masjid? Ya Allah, I am so afraid that if I continue to close one eye and ignore all these opportunities for me to do small acts of kindness- Allah would send a package of “serious grief” to me! A package that says- "Special Delivery: Compliments from your Lord. Thanks for the Service Not Rendered to My other creations". Do I dare face the consequences of such a "special package" delivery just because I am too lazy, too proud, too busy, too tired to be kind, to help, to care, to assist another person? Do you dare, my brothers and sisters? Na`udhubillah. There goes my wobbly feet again. Don't think so, right? Duh! Suddenly I realized that I really needed to know something. What does Allah mean by small acts of kindness? How small is small? What is the quantum of "smallness of kindness" Allah is saying to us here? SubhanAllah… I cannot believe it! The smallest act of kindness is a cheerful, smiling face? Isn't that amazing? I couldn't believe that it is so simple to be kind! Alhamdulillah! SubhanAllah! So, even if we suddenly become Tom Hanks being Cast Away on an island alone- we still have a chance to be kind! How? By serving the animals and plants around us, of course! By being kind to our pets and animals that live around us: don't hurt them, don't throw stones at them and definitely don't burn them! If you see them ill, take them to the vet. Care for them. Feed them. If they drink milk, give them some milk. If they eat biscuits, give them some biscuits. And if they eat meat, please send them back to the zoo because they surely are at the wrong place! Oh, and yes, please do water your plants too- because by doing all these things, there is a reward for us! Yup! Totally! Ya Allah! I was truly shocked when I read this hadith. I could not imagine how a simple act of giving water to a thirsty animal could result in Allah thanking and forgiving us. Isn't that a reward by itself? Don't you feel at this point that you truly want to look for any citizens from the Animal Kingdom which is thirsty or hungry just so that we could receive words of thanks from Him, the Almighty, plus be forgiven for the sins we have done? Then, suddenly, I realized the amazing lessons for me to learn from this wonderful hadith of Prophet Muhammad (peace be upon him). "… The man said to himself "This dog is suffering from the same state of thirst as I did." SubhanAllah, I am amazed at how empathetic this man was! I have never looked at any animals and thought, hey, that little kitty must be as hungry as I was just now! But that was exactly what this man did. He looked at the dog, reflected upon himself and remembered how he felt when he himself was thirsty. And because he was able to “feel” what the dog had felt, he decided to go down the well the second time to get the water for the little doggie. I asked myself- isn't this what I should be doing? Whenever I see someone who is in need, shouldn’t I be asking myself - how would I feel if I were in their shoes? Sad? Miserable? Depressed? "... So he went down the well (again)…"
Let us ask ourselves- did this man wait for the dog to come to him and pant 'woof, woof, woof…bark!' (I am thirsty…help!)? Okay, I totally made that line up, but you know what I mean, right? He just saw the dog, felt sorry for it and went to get the water. That's it! So, I asked myself- should I wait for someone I see facing difficulties to ask for help, only then offering my assistance, or should I quickly "go down the well" and help "them" without being asked, just as the man did? held it in his mouth and watered the dog…"
Isn't it amazing that he came up (the second time) holding a shoe filled with water in his mouth? Honestly, I am not sure how he climbed up, but he did! Don't you feel this man has shown us that at times, truly, the act of kindness would require us to be selfless for a bit, you agree? Perhaps to be a little tired, exhausted, worn out, bushed and beat too! Just like if we just came back from school, then our mother asked us to help with cleaning the house. Do you say "yes mum", smile and put on a cheerful face or do you grumble and said that you are tired? If an officemate asked for a lift back home, do you think of the extra five minutes you would spend detouring off your route, or do you say "yes, no problem", with a cheerful face? And if your spouse asked you to massage their head or their feet, do you do a Touch-And-Go job while mumbling that you are tired too, or do you really do it to make them feel better? Did I accidentally hit some nerves? Sorry… (really). But, you know something, my friends? If we think that when we help others, when we are kind to them, we are doing them a favor- we have to think again. SubhanAllah! I could not believe this. Our acts of kindness that we thought we do for others, are in actuality, for ourselves? Look at the hadith again. Allah has promised that so long and as long as we helped our brothers (and sisters), He would help us too! So, really, don’t you feel that the message between the lines is this- if we really want Allah to help us in whatever we do in our lives, we should begin by helping others first? Wow, like Chandler of Friends likes to say, could it BE any clearer than this?! Let me share with you a story I once heard of the man who won a highway contest. Once, a King had a great highway built for the members of his kingdom. After it was completed, the king decided to have a contest. He invited the citizens to participate. Their challenge was to see who could travel the highway the best. On the day of the contest, the people came with fine chariots and some came in their track clothes, too! People traveled the highway all day. Whenever a person arrived at the end of the highway, he would complain to the king that there was a large pile of rocks and debris left on the road at one spot, and this got in their way and hindered their travel. At the end of the day, a lone traveler crossed the finish line and wearily walked over to the King. 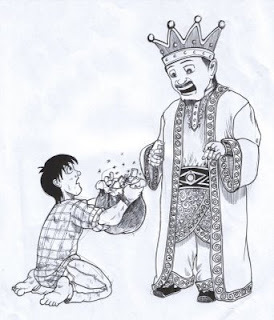 He was tired and dirty, but he addressed the King with great respect and handed him a bag of gold. He explained: "I stopped along the way to clear away a pile of rocks and debris that was blocking the road. I found this bag of gold that was under one of the big rocks, and I want you to return it to its rightful owner." The King replied: "You are the rightful owner." The traveler replied: "Oh no, that is not mine. I've never own such money." "Oh yes," said the King, "you've earned this gold, for you won my contest. He who travels the road best is he who makes the road smoother for those who will follow." Ya Allah, this story made me think. Have I made the road smoother for others? Have I helped remove the debris that was blocking the road of others? Or have I pretended that I didn't see it? Or worse, have I simply complained about all the "debris" I found on the road and not done anything about it? What about you, my brothers and sisters? Have you missed the pot of gold because you didn't remove the "debris" for others? Have you wondered how many pots of gold you missed because you weren't concerned enough to take the time to move or remove the debris along your path so that others could conveniently pass through? not because they are nice, but because you are. The question is - Are we? I've read your book, and will soon get the second book. Long time ago (when I started reading English) I came across the pbuh word after the name Muhammad, and people read (and then even write it) as "peace be upon him" (the Rasulullah). From what I understand, since pbuh comes from 'sollAllahu 3alayhi wasallam', then it should be read (and write) as 'peace and blessings be upon him'. For the English writing omitted the "be, of, for, etc" words (what's the term for these words? I forgot hehe) in acronyme, I thinks the letter 'b' in 'pbuh' stands for blessings. Jazakallah Khairun for reminding us to be kind to our fellow human beings and to plants and animals:)Masha'Allah it was very inspiring especially the hadiths, ayahs and quotes. "Be kind everyone's fighting a hard battle"
Salaam Brother Ashraf Latif, i wont be able to verify if the alphabet B in pbuh means 'be' or 'blessings'! :) But, it is interesting that you brought that up. It somehow gave me something new to think and ponder about today. Not really about the 'B' alphabet, but, something interesting that comes with it. Maybe you will one day read about it in my book or blog post! JazakAllaah khayran for your support for my second book. See you around! Dear Sis Qudsiya, How are you? Hope things are great with you! JazakAllaah khayran for the sweet words. I am happy that you enjoyed the story! Alhamdulillaah. Sis, you will be absolutely delighted to know that the quote you just mentioned, i have it in another story in the Life is an Open secret- You, Me and We that talked about smiling! And i pray that when you read that story, it will keep you smiling too. What a wonderful and stimulating story to read on an unusually slow day @ work on a Friday afternoon!! Makes me wanna go home and feed the fish and water the plants!! There are two points that I came across that I want to mention though. #1: the Here-I-AM part I first read the quote to MEAN that it's not good to be a here-i-am person because that's selfishness and when a person enters and focuses on others as an "Ah, there you are" instead of themself "here i am". So when i continued reading to the next paragraph I was really confused about why you were praising a here i am attitude until I realized you saw it the opposite way. #2; the thirsy dog/well part: the man is not climbing up with one hand he is using two hands to climb out of the well and he's holding his shoe filled with water in his mouth. Which is even greater show of kindness because who REALLY would put their own wet shoe in their mouths for a dog? subhanAllah. Mash'Allah may we all be like him. I loved the king and gold part too. How many times really DO we clear the road for others and not jsut actaul roads but in all aspects of life. What a great questin and action to ponder and insha'Allah DO. Oh my goodness, i have to say JazakAllaah khayran a million times to you for highlighting the error i made. The funny thing is, this piece has gone thru layers of individuals- writing-reading-editing- reading-commenting etc and no one picked it up! Talking about having sharp eyes! MashaAllaah. I am so glad that you found this blog. Please do share it with others that you think could benefit from it, inshaAllaah. I have got many readers from the UAE too and now, many of them has become my personal friends. I think, by September the latest, all major bookstores in UAE will be carrying Life is an Open Secrfet book series as i have already engaged a distributor for my books there, inshaAllaah. Take care sis, and i do hope to see you dropping by this Life storyteller motivational blog again soon! I'm glad that the 2nd book will be coming very soon. Yet to read the first one (I did have a glance at it). Do keep on writing as what you've done I believe could and have motivate others to do the same. p/s : I'll get both version once the 2nd it out in the book stores. I have bought your first book and I am reading it on my way to the university every day. I finished like half of it and I like it. I hope you're well and happy. May Allah bless you for writing inspirational stories for those in need. My mother bought me your first book and even though when I first read it, I was skeptical at first because I didn't believe in motivational stories, I found that your stories decimated my pessimism and I was staggered. I love it and I found that I had been in the wrong for quite some years. Your book made me think. After a while, I read it for the second time without any prejudices to fully appreciate it and thank you because the book changed my outlook in life. Sis Zabrina, if you don't mind, can I ask you for an advice? I am still in high school and I've been having this problem ever since Form One. The thing is, I found it hard to fit in with my friends in school and sometimes, I would rather just to be left alone. Yet, at the same time I would crave for company so much that I cling to people and disgusts them. I don't like it and your book gave me strength to change. I've some best friends at school and some budding ones. However, even though I was happy with them, I get jealous if they have other friends. I felt left out and because I didn't want to be hurt anymore, I abandoned them first. My friends were hurt and I felt guilty and mad at myself. I tried and tried to mend this, to no avail. Now, I just stay quiet in my corner of the class so that I won't hurt anyone anymore. But I don't want this to continue anymore. I want to live, not just stay in the shadows. Please, can you advise me what to do? I am tired and I don't know what else to do other than pray.